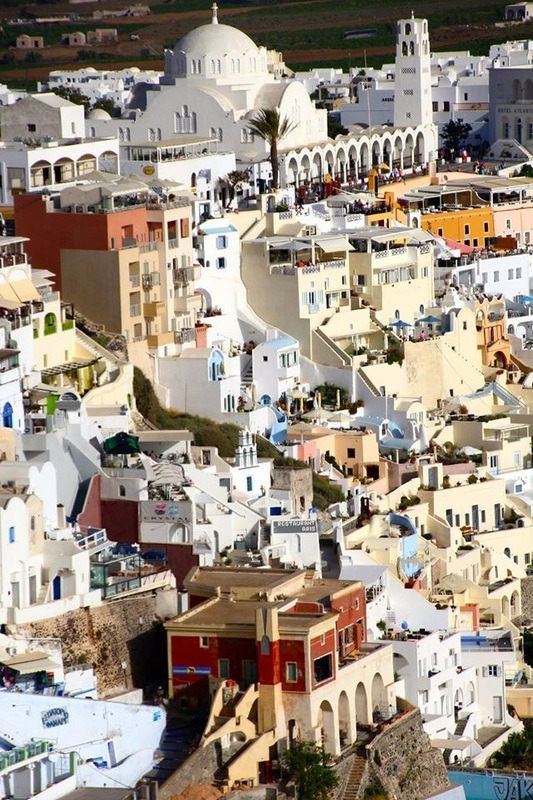 One of the most spectacular of all the islands is Santorini. You may hear people refer to it as “The most beautiful place in the world” and it definitely does deserve this title. The uniqueness of this special place makes it like no other. Every year, thousands of tourists visit Santorini to discover the famous submerged caldera, the volcano’s crater, which is situated today in the middle of a 32 square miles basin of water. Around the basin, hanging on cliffs of 150m to 300m height, one can admire some of the most beautiful traditional villages of the Cyclades. The island’s geological history began at the time when Europe and Africa were still joined. The Aegean was dry land and linked to the mainland of Greece. After a number of geological upheavals, the Aegean sank beneath the surface of the sea. (about six million years ago) The land that we now see were once the mountain peaks of the lost Aegean. 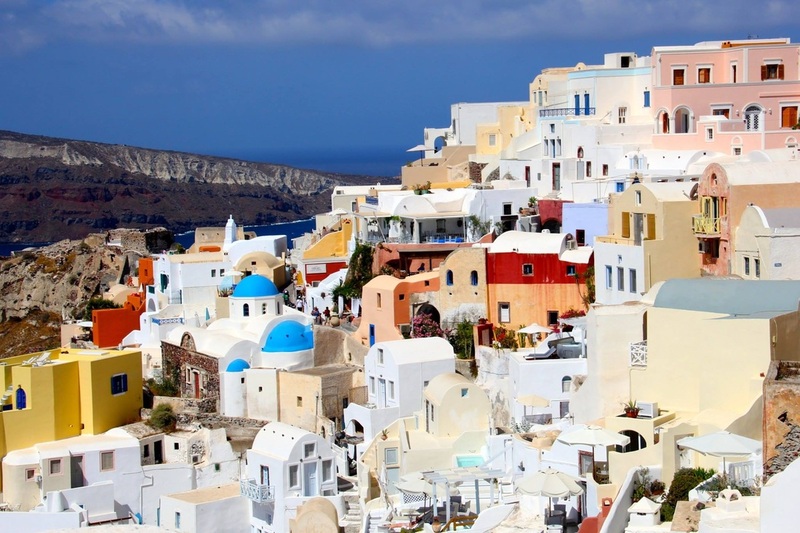 In 1450 BC the volcano erupted changing Santorini forever. The center of the island sunk and Santorini as we know it today was left. The explosion exterminated all life on the island and produced a tidal wave so immense (820feet or 250m) it killed the entire civilization on the island of Crete, less than 75 miles to the south of Santorini. More recently the earthquake of 1056 caused massive destruction to the island. Santorini is listed by some as their most favorite destination in the world, and many of our traveling friends admit to shedding tears of joy and bursts of emotion as they sit and gaze at the iconic blue roofs, white-stone walls and watch the glorious sun set over the ocean. Santorini is volcanic, with a breath-taking view down the sheer cliffs to the silent volcano. On one side it is dotted with villages and restaurants. You could be forgiven for thinking you were actually IN A POSTCARD. Many people do not realise that there are more than 6,000 islands in Greece, of which 227 are inhabited – it’s a guarantee that there is much to do and lots to explore. To reach Santorini from Athens you can catch the Ferry, or fly into the airport. 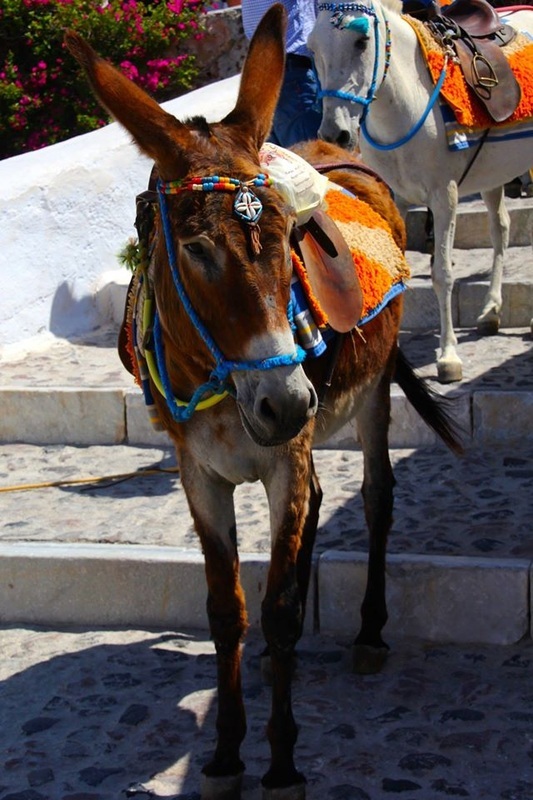 If you come to Santorini by ferry you will have the option of getting from the port to the capital city Fira by either walking up the zig zag steps (over 600 steps), travel by donkey along the same steps (which means if you walk you have to be very careful not to step in the donkey poo) or you might like to take the cable car to the top. When approaching Santorini by sea the sheer cliffs with the white buildings draped over the top resembles the icing on the top of a cake. Once at the top of the cliffs you will find yourself in another world. The tiny cobbled streets are for pedestrians only and twist through quaint shops. Restaurants cling to the side of the cliff with a view that is indescribably. The sound of Greek music adds to the whole atmosphere of the island as you stroll through the streets, with every turn seeing something different and unusual. This is a WOW factor like no other. While on Santorini you can visit the Archaeological Museum opposite the cable car station where you will see prehistoric finds, figurines and artefacts from Hellenistic and Roman eras. 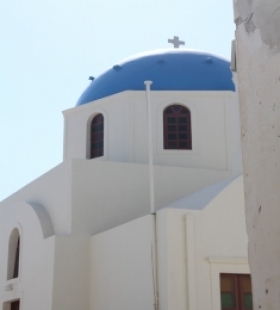 Other sights include the Megaro Ghisi Museum, the Agiou Mina, an 18th century church which has become the symbol of Santorini with it’s blue dome and white bell tower and the Orthodox Cathedral known as Our Lady Belonia. Ancient Thira is approximately 6 miles southeast of Fira. 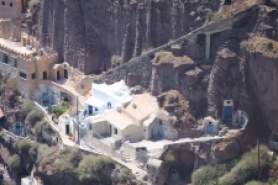 Here you will see remains of the ancient inhabitants of Santorini. The ruins stand on terraces overlooking the sea. Akrotiri is located 7 miles southwest of Fira and is one of the most impressive archaeological sited in the Cyclades. 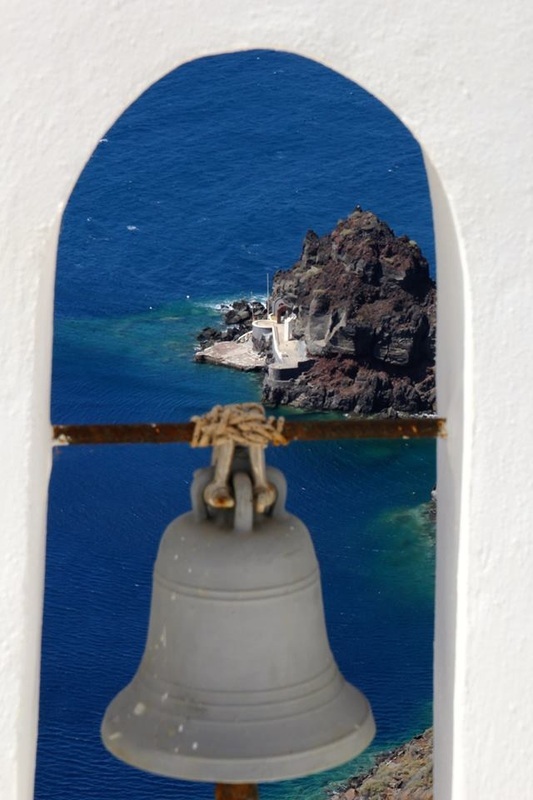 Oia is a gorgeous quaint little town at the northern tip of the island about 7 miles from Fira. If you go to Santorini make sure you don't miss seeing Oia. This town is famous for its spectacular sunsets and beautifully restored houses that were damaged in the earthquake. There are some amazing art galleries that have locally made works that you would never see anywhere else. A must see. Antoniou and Boutari Wineries produce some beautiful wines that are popular exports are open to the public. Santorini is voted as one of the best holiday destinations in the world by many people. Check out the other best holiday destinations. 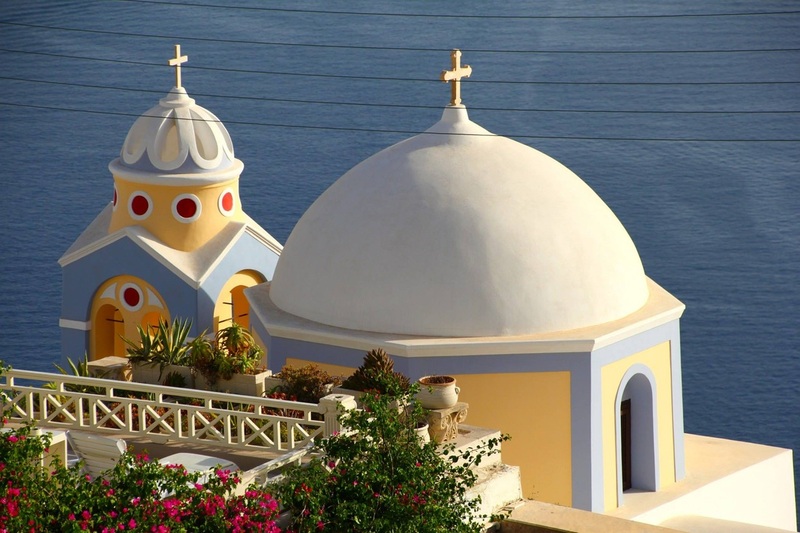 Send us your story about a holiday destination or experience in Santorini or the Greek Islands.